Woke up at 4:45 a.m. this morning so I could make it to the Dutchess County airport to view the balloons lift-off at 6:00 a.m. It was a beautiful morning oh, and what a beautiful sight it was to see the balloons being inflated, one-by-one, and, one-by-one, lift-off and soar into the sky. 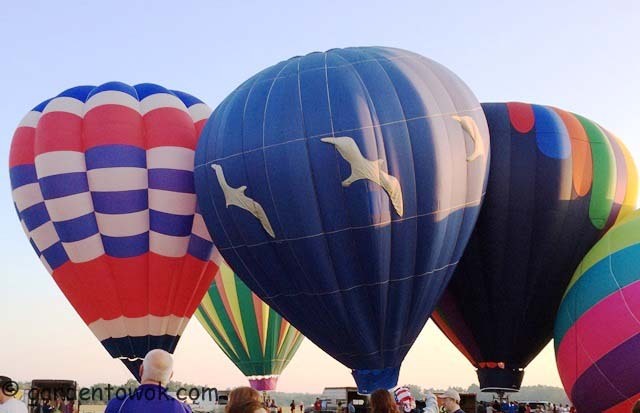 The Dutchess County Regional Chamber of Commerce hosted the 25th Hudson Valley Hot-Air Balloon Festival on July 10, 11 and 12, 2015. Yesterday’s lift-off was from the Poughkeepsie waterfront, 22 balloons were launched from the site. One the balloons flew over my house yesterday evening. Was it this one in the above photo????? Or was it the one in the photo below? Too bad I did not have my camera with me at the time. The balloon below belongs to my friend’s, Phyll, son Brian who is also the pilot. Brian getting ready for lift-off with the help of his niece Annika (in red) and nephew Stefan (in blue). Annika and Stefan holding down the crown line (a thick rope). In the photo at left is proud daddy, Tom, who flew balloons for 40 years before handing it over to Brian who is in the basket. Hot-air ballooning is definitely a family affair. 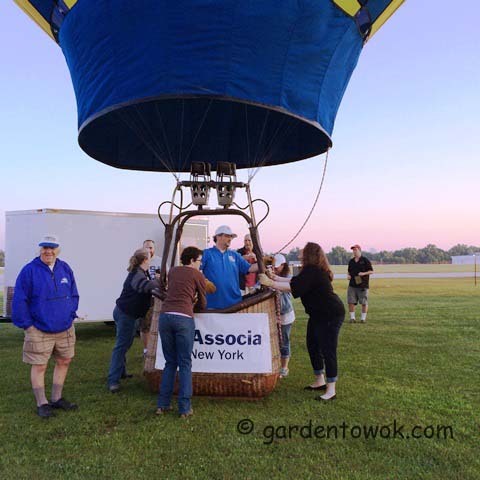 This entry was posted in Dutchess County, Husdon Valley and tagged 25th Hudson Valley Hot-Air Balloon Festival, Dutchess County, hot-air balloon, New York, Poughkeepsie, poughkeepsie journal. Bookmark the permalink. Under picture of kids, Annika and Stefan, The rope is called the crown line. Tom has been flying for 40 years. Otherwise pics look great! Thanks for posting! I will watch for your friend Rose tonight. She will find us I am sure. I will be ready for snooze soon! 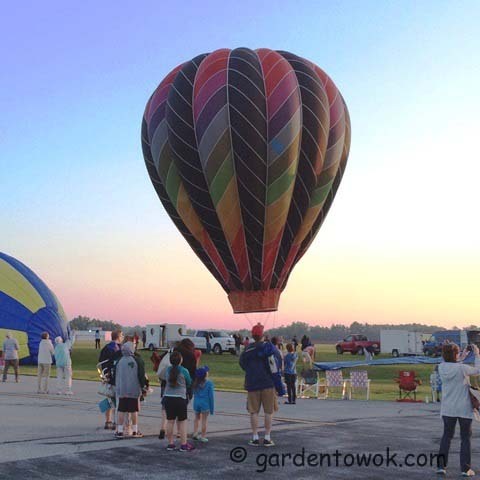 I had fun at the balloon launch this morning and it was fun writing this post. Will add the information and make the corrections. That’s amazing! I love the romance of hot air ballooning but in reality it’s quite noisy and the landings are quite hard. I took JT on a hot air balloon ride for his 40th birthday a couple, I mean a few years ago. We only had four people in the basket, a young kid around 18, an 80 year old lady and John 40 (I am significantly younger!). The landing was rough but well worth the views (I landed on the 18 year old, the other lady landed on JT!). It was incredible how much we heard from the ground when the blower wasn’t on (1,000 feet up)! Your photos are beautiful, definitely worth getting up early for! 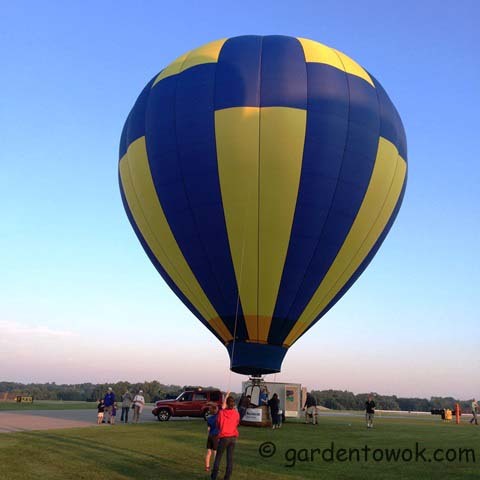 Thanks for sharing Norma, what a beautiful day for ballooning. There was the pilot too! Oh yes, a pilot is needed indeed. Yes, it was a most beautiful day, actually a beautiful weekend, for ballooning every flight got off, the most successful festival year. Hey it is Phyllis and Tom , great picture of Tom! Ask him if he is still riding his motorcycle? Two of the nicest people you’d ever want to know right Norma? 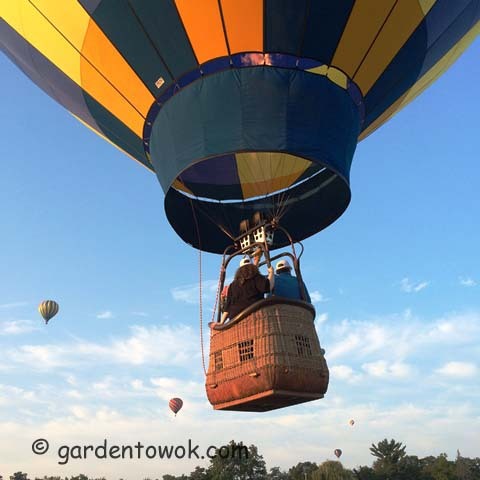 What a beautiful sight :0) I had a balloon ride with Tom back in 1980 before I ever moved to Poughkeepsie, still have my balloon pin from the “Friend Ship Too”….did you ever go up ? Great pictures and a wonderful memory relived. Yes, Tom is still riding his motorcycle and yes, Tom and Phyllis are 2 of the nicest people. No I have not gone for a balloon ride, some day maybe. Thanks for the compliment glad my post took you on a trip down memory lane. So when are you coming for a visit? I’ve never been in a hot air balloon before but I would love to take an early morning ride in one. What a fun event! It was a really fun event and the weather cooperated for the entire weekend. Perhaps you will have the opportunity to ride in one some day. Norma,beautiful pics. Certainly was worth your getting out of bed so early for that event. “rising with the roosters” as they say. Thanks for keeping us informed on these wonderful events. Would not have known about them otherwise. Thanks. Yes, it was worth the effort getting out of bed the that early sure glad I made the effort. That must have been a sight to see! Don’t think I’d ever go up in one (I prefer to keep my feet on the ground! ), but seeing them go up en masse would have been quite something. It definitely was a beautiful sight especially with the clear blue sky and the morning sun rise, looking forward to next year’s event. How fun to be actually out there and watching the process of getting ready! Beautiful photos Norma. Wishing you a super Sunday! 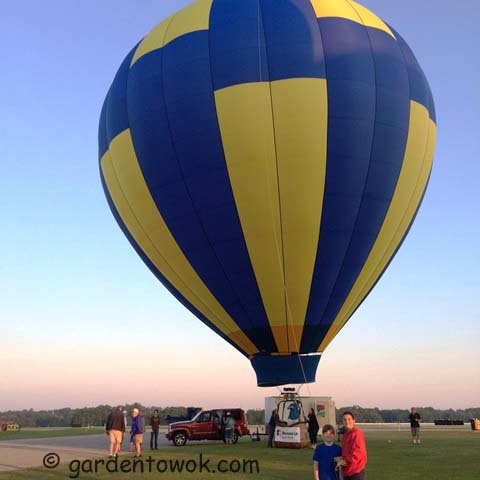 It was tons of fun I could get up close and personal with the balloons and visit with my ballooning friends. Wow, you do Balloon Festivals well over there Norma. 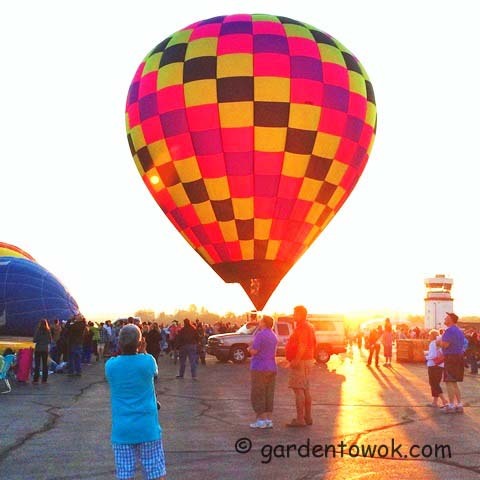 I’ve had the Albuquerque Balloon Festival on my bucket list for years. Had no idea there was one in Poughkeepsie too! Looks amazing. The colours! It was exciting to see the balloon flying over my house, I quickly called my neighbour and friends who live nearby to look in the direction of my house, they too were excited. I too have never been in a hot air balloon, may be one of these days I will have the opportunity and courage to soar in one.